Read pricing, features, and a review for the Lorex 4K Ultra HD IP NVR Security Camera System with 32 IP Cameras. The Lorex 4K Ultra HD IP NVR Security Camera System with 32 IP Cameras is a security camera system from Lorex. It boasts a night vision range of up to 250 ft. and a 6TB hard drive. 6TB hard drive, expandable up to 16TB. 4K NVR can supports 32 cameras. Pros: Permission system allows each person to see the cameras their accounts are set up for. Cons: May be too costly for small businesses. Bottomline: An excellent camera system with crisp 4k output. What are some alternatives to the Lorex 4K Ultra HD IP NVR Security Camera System with 32 IP Cameras? 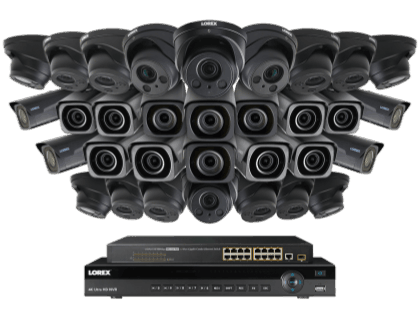 Where can I buy the Lorex 4K Ultra HD IP NVR Security Camera System with 32 IP Cameras system? The Lorex 4K Ultra HD IP NVR Security Camera System with 32 IP Cameras is available on Amazon and on the Lorex website. Does the Lorex 4K Ultra HD IP NVR Security Camera System with 32 IP Cameras work at night? Can the Lorex 4K Ultra HD IP NVR Security Camera System with 32 IP Cameras be used in any weather?